On Friday I checked out a new spot in Brentwood, right on San Vicente Boulevard, called Café Rivva. The owner contacted me and invited me to come check out the spot. Good thing that he did, because I'm not sure I would have ever noticed it -- it's location, while located right on San Vicente, is on the third floor of Brentwood Gardens, so it isn't friendly to a lot of foot traffic. Regardless of its location, I was really excited to check out this place. 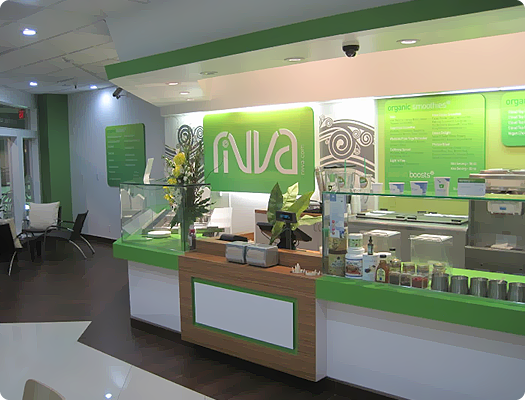 Rivva offers a vegetarian and vegan salads along with organic smoothies and frozen yogurt. The Café reminded me of Mani's on Fairfax (soon to be Mani's on Maple), one of my favorite spots in Los Angeles. 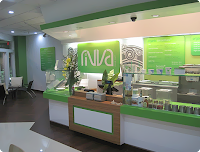 Upon entering I was greeted by Chris, the owner of Rivva. Having come to Los Angeles two years ago from Ireland, Chris was looking to bring some of his experience working at a juice bar there and introduce it to Los Angeles. He chose the right place: Café Rivva has a great outdoor patio that was perfectly drenched in sun when I visited. 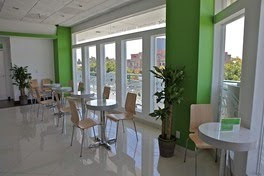 The café also offers Wi-Fi for your internet needs. The fare at Rivva fits in nicely with the vibe of Los Angeles; it's healthy, flavorful, and delicious. I opted for a California Sunset smoothie which was out of this world. I visited Rivva after a long run along the ocean in Santa Monica so I was definitely hungry. The California Sunset smoothie picked me right up; none of the juice is from concentrate and the restaurant endeavors to use fruit from the Brentwood and Santa Monica Farmer's Markets. The smoothie, packed with coconut water, goji berries, banana, pineapple, and mango, was a great pick-me-up after the long run. For salads I went for a mix of the Rivva, Kale Sesame, and South of the Border salads. The Rivva Salad is the café's signature, packed with strawberries, candied walnuts, spinach salad, soft feta and a parmesean dressing. I really enjoyed the strawberries and spinach combination, but it wasn't my favorite of the salads. That distinction is reserved for the Kale Sesame salad -- it was really delicious. I loved the sesame dressing and can't remember the last time I had a great gluten free sesame dressing (although San-J does make one). Chris and the chef were extremely helpful in picking out gluten free options at the restaurant. I didn't enjoy the South of the Border salad as much as the other two. I'm looking forward to getting back to Café Rivva soon and checking out the Cauliflower Korma mixed with the Kale Sesame Salad. Throw in a smoothie and I'm set.